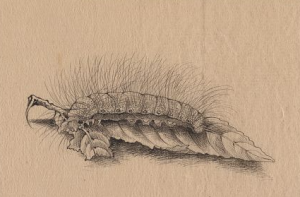 Silkworm caterpillars—such as the one shown in this 1878 drawing—create their cocoons by producing filaments, protein-rich liquids that harden upon exposure to air. To gather silk, manufacturers soften the proteins that bind filaments together and twist the remaining material into a thick yarn. Silkworms can no longer survive in the wild and today appear only in domestication. Many do not mature past the larval stage, as an emerging moth would damage the cocoon filaments. Although additional sericulture methods have been explored, including the introduction of spider silk genes into silkworm populations, the centuries-old process continues around the world. Mulberry trees are an integral part of a silkworm’s diet; the domestic silkmoth’s Latin name Bombyx mori translates directly to “silkworm of the mulberry tree.” The white mulberry (M. alba), native to Asia and now grown in southern Europe and eastern North America, serves as the primary food source for domesticated silkworms. 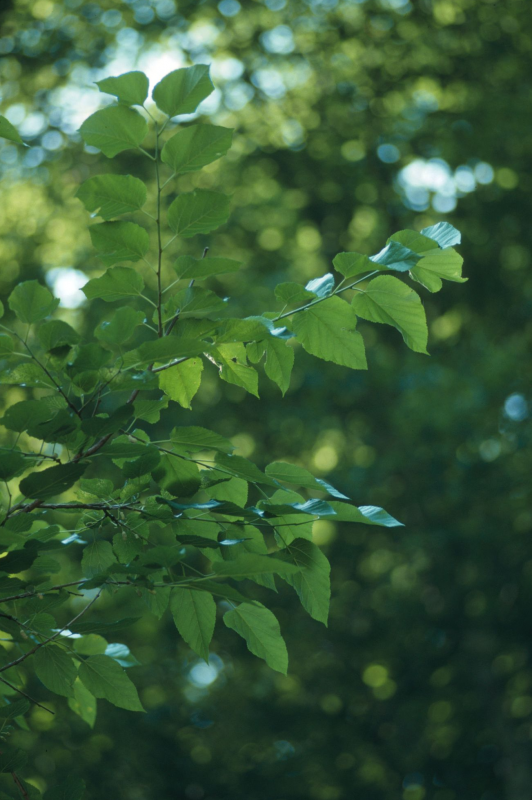 The white mulberry’s fruit is frequently used as a pigmentation agent or an ingredient in desserts, wines, teas, and nutritional supplements. 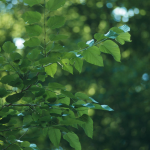 This 1996 photograph shows a red mulberry tree (M. rubra) in West Virginia. 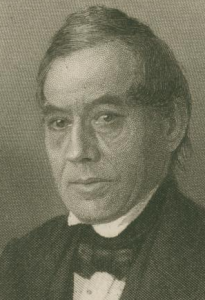 William H. Horstmann (1785–1850), shown here in an early nineteenth-century portrait, immigrated from Germany to Philadelphia in 1815 and established a successful silk-weaving shop. In 1824, Horstmann was the first American textile manufacturer to utilize the Jacquard loom, a mechanical loom controlled by punch cards that became widely used in the textile industry. Around 1831, Horstmann opened a new branch in New York City and built a factory in the Kensington neighborhood of Philadelphia. He partnered with his two sons, William J. Horstmann (1819–72) and Sigmund H. Horstmann (1821–70), in 1843 and renamed the business William H. Horstmann & Sons. The company continued to specialize in silk production, particularly for military uniforms and equipment, as it expanded. A new five-story factory opened at Fifth and Cherry Streets in 1854, eventually employing more than five hundred workers. With over 1,700 workers, Apex Hosiery was the largest hosiery mill in Philadelphia in the late 1920s. William Meyers, the company president, was fervently anti-union and used intimidation to keep workers from organizing. 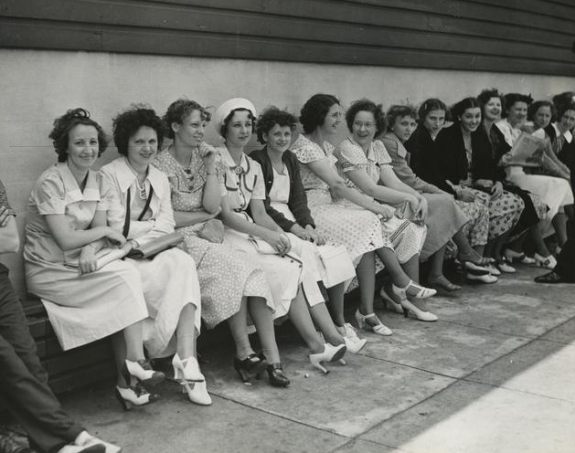 In 1937, Apex employees, several of whom are pictured here, joined the unionized members of nearby hosiery factories to begin a prolonged strike. This led to an overrun of the Apex building and a violent confrontation where Meyers was physically assaulted. Meyers ultimately allowed unionization but sued the labor union for property damage a few years later; the case reached the U.S. Supreme Court in 1940 and was settled in favor of the strikers. Philadelphia’s silk industry remained strong through the early twentieth century but began to decline in the years prior to World War II, part of a major reduction in silk production nationwide. One cause of this decline was the late 1930s introduction of nylon, a synthetic material created by the DuPont Company of Wilmington, Delaware. 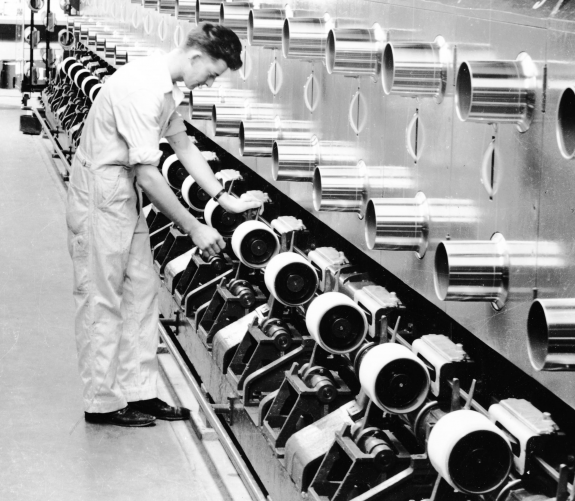 In this c. 1940 photograph, a worker examines nylon production machines at a DuPont plant in Seaford, Delaware. Nylon is created through chemical synthesis, a less costly and labor-intensive process than silk manufacturing. With nylon’s widespread use beginning in the late 1940s, many Philadelphia silk manufacturers ceased operations. Philadelphia’s silk industry began in earnest in the early nineteenth century. 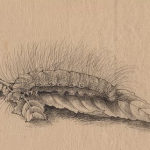 There had been efforts since the early eighteenth century to cultivate the silk worm and establish silk-making operations in the region, but they had proven unsustainable or were carried out on a small scale. Philadelphia’s first successful silk manufacturer began operating in 1815, and by the mid-nineteenth century the city was a major silk producer. Philadelphia’s silk industry remained strong through the early twentieth century, after which it declined dramatically, along with the region’s overall textile industry. Noted Quaker writer and activist Susanna “Suzy” Wright (1697-1784), a woman of many talents and a correspondent with Logan and Franklin, raised silkworms in the 1770s and made a variety of silk products, some of which were reportedly sent to England. The Philadelphia Medical and Physical Journal published her article “Directions for the Management of Silk-Worms” posthumously in 1804. The Revolutionary War interrupted Philadelphia’s nascent silk industry, but efforts revived in the Federal period. In the early 1790s prominent merchant and financier Robert Morris (1734–1806) planted thousands of mulberry trees for silk worm cultivation at his estate at the Falls of the Delaware (later Morrisville) in Bucks County, Pennsylvania, part of a plan to initiate large-scale silk manufacture. Elsewhere, farmers and enterprising businessmen grew silk that was processed locally, usually in homes or small shops, and made into clothing and other textile products. These tasks were generally done on a small scale and mostly by women. Overall, these efforts had limited success. The Philadelphia region did not produce raw silk in large enough quantities to sustain an ongoing industry, while processing the silk it did produce was labor intensive and often not very profitable. Nevertheless, efforts to promote local silk cultivation continued. Civic leader Peter DuPonceau (1760–1844), president of the American Philosophical Society, zealously advocated for the silk industry in the early 1830s. He personally supported local silk growing and production initiatives and petitioned the U.S. Congress, unsuccessfully, for federal support for a nationwide industry. Other prominent Philadelphians who attempted silk cultivation in the 1830s include financier Nicholas Biddle (1786–1844), who invested heavily in mulberry trees at his estate, Andalusia, in Bucks County, and lawyer Philip Syng Physick Jr. (1807–48), who erected a building, known as The Cocoonery, for silk cultivation in Germantown. In the mid-1830s a new species of mulberry tree was introduced into America that purportedly grew much faster and could feed significantly more silkworms than the native species. This gave rise to a brief silk craze, with increased, widespread attempts at domestic silk cultivation and much financial speculation in the industry. The eventual discovery that the new species was unsuitable for the American climate, together with the nationwide financial panic of 1837, put many silk growers out of business and effectively ended the large-scale cultivation of silk in the United States. Small-scale cultivation continued, but from the mid-nineteenth century on, large-scale manufacturers of silk products mostly imported their raw materials. 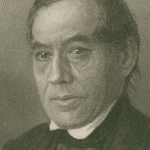 Philadelphia’s first major silk goods maker was William Horstmann (1785–1850), a German immigrant who settled in the city in 1815 and established a successful silk-weaving shop specializing in making tassels, fringe, and lace. In 1824 Horstmann was the first American textile manufacturer to use the Jacquard loom, a mechanical loom controlled by punch cards that became widely used in the textile industry. Around 1831 he built a factory at Germantown and Columbia (later Cecil B. Moore) Avenues in Kensington, and in 1854 the company, then run by his sons, built a large five-story factory at Fifth and Cherry Streets in Old City that eventually employed as many as five hundred workers. The Horstmann company later specialized in making silk materials for the military such as flags, braids, and ornamental trimmings, becoming the nation’s largest producer of such goods. Two other major silk manufacturers were located near the Horstmann plant in the this period: J. C. Graham, established in 1850 near Fifth and Cherry Streets , and Hensel, Colladay, & Company, established in 1851 on Fourth Street above Market. Philadelphia’s silk industry grew significantly in the late nineteenth century. An 1883 general census of Philadelphia manufacturers listed over sixty makers of silk products in the city, as well as several silk dyeing operations. Most of these companies employed anywhere from a handful to a few dozen workers, but seventeen of the firms had over one hundred workers and ten had over 250. Many of the companies were located in what became known as Philadelphia’s Silk District, the northern section of Old City between Market and Vine Streets, east of Sixth Street. Major silk manufacturers were located elsewhere in the city as well. Sauquoit Silk Manufacturing Company, based in upstate New York, built a factory in 1879 on Columbia Avenue in North Philadelphia that in 1888 employed 330 workers, four-fifths of whom were girls. (As in the broader American textile industry, child labor formed a significant part of Philadelphia’s silk workforce.) Orinoka Mills, in Kensington, had eighty-five looms and 250 workers in 1891. By 1900 one-third of the silk products made in America were produced in eastern Pennsylvania, both in Philadelphia and in the coal regions of the northeastern part of the state, where the wives and children of coal miners and railroad workers often worked in local silk mills to supplement the family income. Hosiery items—stockings and socks—were the primary products of Philadelphia’s silk industry in the early twentieth century. Trends in women’s fashion during the 1920s “Jazz Age” created a huge demand for silk stockings, giving rise to a number of large Philadelphia hosiery mills that by the late 1920s employed thousands of workers. The largest were Apex Hosiery, with over 1,700 workers; Gotham Silk Hosiery, with over 1,500 workers; and H. C. Aberle Company and Triumph Hosiery Mills, both with over 1,100 workers. 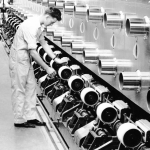 Labor unrest struck the industry in the 1930s. 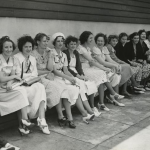 In April 1937 workers staged a successful sit-in at Artcraft Silk Hosiery, another major producer, when management resisted their efforts to unionize. A few weeks later, a prolonged, violent strike at Apex Hosiery also resulted in success for the workers. Unions played a powerful role in the city’s silk industry at this time, but later lost their power when the industry’s fortunes ebbed. Philadelphia’s silk industry remained strong through the early twentieth century but began to decline in the years prior to World War II, part of a major reduction in silk production nationwide. In 1930 approximately one hundred thousand silk looms were operating in the United States; by 1950 the number had dropped to about three thousand. Subjected to the same adverse factors that eventually impacted many kinds of textile manufacturers in urban areas of the mid-Atlantic and northeastern United States—cheaper labor and energy costs elsewhere, competition from producers of cheaper goods, and increasingly strained relations between labor and management—several large Philadelphia silk manufacturers ceased operations or moved their factories out of the city in the 1930s and 1940s. Two other mid-twentieth-century developments—one temporary, one permanent—also adversely affected the American silk industry. During World War II, supplies of raw silk, already curtailed by the interruption of its importation from Japan, were commandeered by the military for parachutes and other war needs. Of more lasting impact was the introduction in the late 1930s of the new synthetic material Nylon by the DuPont Company of Wilmington, Delaware. Nylon provided a cheaper, more durable alternative to silk for everything from women’s stockings to textiles for military applications. Its widespread use beginning in the late 1940s resulted in a huge decline in the demand for silk. By the late twentieth century, the heyday of silk manufacture in Philadelphia, like that of the region’s broader textile industry, was over. Brockett, L. P., The Silk Industry in America: A History, Prepared for the Centennial Exposition. New York: The Silk Association of America, 1876. Field, Jacqueline et al. American Silk, 1830–1930: Entrepreneurs and Artifacts. Lubbock, Texas: Texas Tech University Press, 2007. Kanefield, Teri. The Extraordinary Suzi Wright: A Colonial Woman on the Frontier. New York: Abrams, 2016. McConnell-Sidorick, Sharon. Silk Stockings and Socialism: Philadelphia’s Radical Hosiery Workers from the Jazz Age to the New Deal. Chapel Hill, N.C.: University of North Carolina Press, 2017. Scranton, Philip. “Large Firms and Industrial Restructuring: The Philadelphia Region, 1900–1989.” Pennsylvania Magazine of History and Biography 116, no. 4 (October 1992): 419–65. Stepenoff, Bonnie. “Child Labor in Pennsylvania’s Silk Mills: Protest and Change, 1900–1910.” Pennsylvania History 59, no. 2 (April 1992): 101–21. Wycoff, William C. Silk Manufacture in the United States (report prepared for the Tenth Census of the United States). New York, 1883. G. B. Mutier notebook (Am. 10685), Mrs. Howard W. Lewis collection of early Philadelphia businesses papers (#367), Peter Stephen Du Ponceau papers (#181), and the Tea and Silk Merchandise books (Amb .559), Historical Society of Pennsylvania, 1300 Locust Street, Philadelphia. Orinoka Mills factory building, 2753 Ruth Street, Philadelphia. Viscose Village (Tenth Street to Chestnut Street and from Walnut Street to Yates Avenue) and American Viscose Corporation building, Marcus Hook, Pa.
What about Suzy Wright who grew silkworms in 1772 and wrote a scientific article “directions for the Management of Silkworms,” which was published in the Philadelphia Medical and Physical Journal? Thank you, Peggy Hartzell, for suggesting that Suzy Wright’s work in silk production and her writings on the subject be included in the essay. I have added a passage about it. The story of this remarkable eighteenth-century woman should be better known.